At the Harvard Catalyst Health Disparities Research Program symposium “How Disadvantage Gets ‘Under the Skin’” participants from varying disciplines considered how recent advances in epigenomics might provide methods and insights that can reduce health disparities. For decades, researchers studying health and health care disparities in certain racial, ethnic, socioeconomic, gender or sexual orientation groups have found that many of these populations have a higher risk of chronic diseases and poorer outcomes than others. 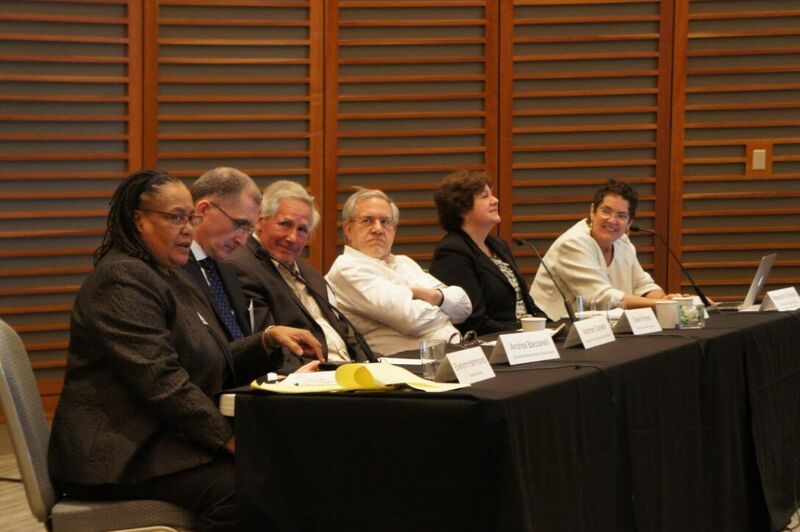 “Today we have approximately 67,000 excess deaths among African-Americans every year, for example,” said Alexandra Shields, HMS associate professor of medicine and co-director of the Harvard/Massachusetts General Hospital Center on Genomics, Vulnerable Populations and Health Disparities, at a recent Harvard Medical School symposium on the topic. “That’s the equivalent of a 747 jet, full of passengers, dropping out of the sky every two and a quarter days,” she said. There has been little progress, however, in reducing these disparities, Shields said, suggesting that perhaps a more holistic approach might be a better way to address the issue. “I think we need to shift our thinking upstream toward better understanding the exposures, mechanisms and pathways through which these disparities are actually produced and sustained in our culture,” she said. At the Oct. 2 Harvard Catalyst Health Disparities Research Program symposium, titled “How Disadvantage Gets ‘Under the Skin,’” participants from varying disciplines considered how recent advances in epigenomics might provide methods and insights that can reduce health disparities. The epigenome consists of chemical compounds that can directly or indirectly affect DNA in the genome and change the way cells use the DNA’s instructions. Disruptions in the normal processes through which epigenomics turns on or turns off gene expression has been associated with various cancers, obesity, heart disease and a growing list of other health effects. “Trauma, discrimination, poverty and exposure to air pollution might be critically involved in dysregulating epigenetic pathways through epigenetic mechanisms like DNA methylation and noncoding RNAs,” Shields said in her symposium introduction. Studies show that some environmental exposures are experienced disproportionately by minorities and other disadvantaged communities, she added. Finding sites of methylation in regions of the genome that are functionally relevant may be a biomarker, a point to intervene to prevent diseases. The first panel featured experts on methodology who considered the challenges in measuring and analyzing epigenomic data. Cell heterogeneity is a major problem when studying DNA methylation across cell types, pointed out Liming Liang, associate professor of statistical genetics at the Harvard T.H. Chan School of Public Health. Rather than tediously measuring a pool of cells one by one looking for those that are methylated, he proposed a statistical method that could detect cell-specific signaling. Confounding variables and the small size of effects when genes are turned on or off make it difficult to determine if results are meaningful. Linda Valeri, HMS instructor in psychiatry at McLean Hospital, said causal modeling could provide a possible way to know if epigenetics is mediating the effect. The next panel shifted to looking at the kinds of environmental exposures that are most important for understanding health disparities and how they are produced. Neonatologist Heather Burris from Children’s Hospital of Philadelphia said she is acutely aware in her practice that black infants are twice as likely to die in their first year of life as white infants. Burris is studying the relation of psychosocial stress and epigenetic modification to look for more answers. Others on the panel talked about research on epigenetic signatures that increase the risk for post traumatic stress disorder, including the interactive effects of the FKBP5 genotype and early child abuse. By studying a diverse group of 5,000 people, the National Consortium on Psychosocial Stress, Spirituality and Health is investigating the mechanisms through which systematic disadvantage increases risk of chronic disease and produces health disparities, explained collaborator Andrea Baccarelli, chair of the Department of Environmental Health Sciences at the Columbia University Mailman School of Public Health. Baccarelli is working with Shields in her role as principal investigator. As part of their studies, they are doing epigenetic analyses of six candidate genes related to psychosocial stress and then they said they plan to “go on a fishing expedition” to find other methylation sites throughout the epigenome. Speaker Steven Hyman, professor of stem cell and regenerative biology, reminded the group that determinants of behavior are highly complex, as is finding markers to intervene. Hyman was former director of the National Institute of Mental Health, provost of Harvard University and now director of the Stanley Center for Psychiatric Research at the Broad Institute of MIT and Harvard. “This work is promising but early. I think we need to prepare for a bit of fuzziness on the effects of discrimination and poverty on genetic mechanisms and not get ahead of ourselves,” he said. Undaunted, the symposium participants divided into four groups and were given an assignment to come up with a $50,000 pilot research project in a half hour that would contribute to a better understanding of health disparities. From their ideas, the plan is to then seek funding for a collaborative pilot project utilizing epigenomics. Pilot project awardees collaborate to improve health.